Continuing a proud tradition at Washington Union High School, the 2018-19 Washington Union High School (WUHS) Link Crew welcomed incoming freshman students at this years Freshman Orientation event. New 9th graders participated in a school rally, community-building activities, and academic planning, in an effort to prepare them for success in high school. New to this year’s event was the promotion of WU’s ten Career Pathways designed to connect students with college and career options after graduation. The WUHS Link Crew is a high school mentoring program. The program is designed to make the transition into high school easier for new students by connecting them to students who already attend the school. Link Crew leaders are chosen by current teacher as students who serve as positive role models on campus in both academic and extra-curricular arenas. 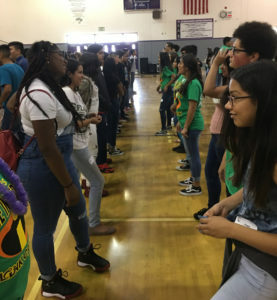 Each Link Crew leader is assigned a group of incoming 9th graders to connect with and support during the first few weeks of school. WUHS Link Crew hosts Freshman Orientation at WUHS.